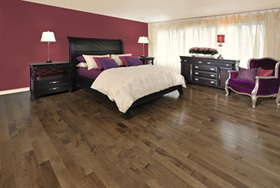 Create a welcoming and comfortable space that invites relaxation and sleep by thoughtfully arranging your bedroom. Here are some tips for creating a space that you will enjoy and rest well in. Cluttered bedrooms can lead to a sense of anxiety that can disrupt your sleep. If you don’t need a piece of furniture in your bedroom, don’t use it. Extra desks, tabletops, and dressers create space for things to accumulate. Having less in your bedroom also means less to clean and less surfaces to catch dust which can aggravate allergies and lead to sleepless nights. When you have determined what you do need start with placing the most important piece of furniture, your bed, first. Apartment Guide suggests that this piece of furniture is both the largest and typically the focal point. Usually you want to place it in the middle of the longest wall or at an angle in a corner. Do you watch TV in your room? If so, a long low dresser opposite your bed can double as a TV stand. Are you an avid reader? A short bookshelf beside the bed can also work as a nightstand. Be sure you put each piece of furniture in your bedroom to work so you can get the most out of your space. According to HGTV interior designers often use triangulation to create visual interest. You can accomplish this easily in a bedroom by placing nightstands on either side of the bed and an interesting headboard or work of art above the bed. This will create an attractive space that is comfortable for the viewer. Symmetry also sets the viewers mind at ease. When there is enough space, having a symmetrical room centered around the bed may make it easier to relax. Remember that sleep is your ultimate goal in your bedroom. Do whatever you need to do to be able to sleep well in your space. If you only need one nightstand, don’t worry about symmetry. If watching TV keeps you awake at night, get rid of it. If your desk makes you think about work too much, put it in a different room. These are just a few tips for arranging your bedroom so that you can get the most out of it. Have you noticed if a bedroom arrangement helps you sleep better or keeps you awake at night? Where do you start when you think about arranging your bedroom? While snoring is relatively harmless, it can be frustrating, especially if you share a bed. There are a few different causes for snoring and a variety of solutions. It may take a bit of trial and error to pinpoint an effective solution. 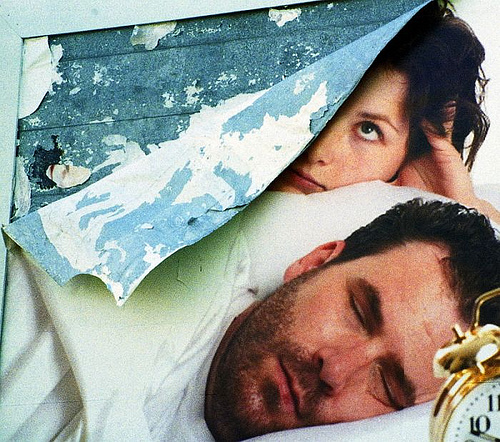 With some persistence you may be able to prevent snoring and get a better night’s sleep. Snoring can be caused by your soft palate, in the back of your throat, relaxing and vibrating as you breathe. It can also be caused if your nasal passages are clogged. The last, and more serious cause of snoring can be obstructive sleep apnea. Obstructive sleep apnea has more serious side effects, such as excessive daytime sleepiness and high blood pressure and should be addressed by a doctor. When snoring is caused by the soft palate relaxing into the throat, studies suggest changing your sleep position. The soft palate collapses into the throat and obstructs your breathing if you are laying on your back. Sleeping on your side or stomach may be all you need to do to prevent snoring. You can position pillows to prevent you from rolling onto your back, or even attach a tennis ball to the back of your pajamas. Alcohol can also cause your muscles to relax and should be avoided a few hours before sleeping. WebMD also suggests that in some cases weight loss can also reduce snoring that is caused by the soft palate. When snoring is caused by clogged nasal passages, you can address both the nasal passage and what causes the clogs. WebMD recommends clearing your nasal passages before you sleep by taking a hot shower, or using a sinus cleanse such as the neti pot. Strips that hold your nasal passages open can also help in some cases. Your clogged nasal passages may be caused by something in your room. Allergens such as dust mites, and pet dander can cause you to feel congested at night. If you don’t normally feel congested during the day, try washing your pillows more often, dusting the furniture and not allowing your pets to sleep with you. If that doesn’t help, you may need to consider getting a mattress cover to prevent dust mites or even removing your carpet. WebMD so warns to avoid over the counter drugs and solutions because they are rarely tested to prove effectiveness. With a few home remedies, you can reduce your snoring. If your snoring persists and remains bothersome for you or your partner, you should consult a doctor to see if there is some other underlying problem. Chamomile tea is usually made from the crushed dried flowers of the chamomile plant. They can be found in tea bags or used loose leaf and steeped with an infuser. It has been traditionally used as a calming drink, helpful for inducing sleep. There are few studies that have been done to either prove or disprove the effectiveness of chamomile, however, general consensus and generational wisdom seems to indicate that it is a worthy sleep aid. WebMD sites one Japanese study in which rats given chamomile oil fell asleep as fast as rats given tranquilizers. Health on a Budget sites a study in which patients given chamomile were relieved of some General Anxiety Disorder symptoms. While there is little available to prove the effectiveness of chamomile, there is certainly no harm in trying it, to help you sleep at night. It is very mild and will not have any negative side effects on most people. There are only a few instances when a person should not drink chamomile. Because it can induce premature labor, it should be avoided by women who are pregnant. Web MD also warns that people who are allergic to ragweed should avoid chamomile. The plants are related and it can induce a similar reaction. The tea should be taken 30-40 minutes before your expected bedtime. 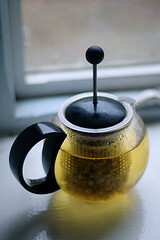 If you have a tendency to wake during the night to use the bathroom, you may want to avoid tea as a sleep aid. In addition, to the properties of the chamomile helping to relax your body and ease you into sleep, the ritual of beginning your bedtime with a cup of chamomile tea may help as well. This nightly routine will signal to your body it is time to sleep and help you enter sleep faster. Health on a Budget also discusses the many other benefits of chamomile, including reducing inflammation, relieving stomach cramps, treating wounds and easing skin ailments such as eczema. If you are unable to fall asleep at night because you are experiencing stress or anxiety, or you wake up frequently with your mind racing, chamomile tea may help you get the rest you need to feel better. Do you have a favorite nighttime drink? Is Special Laundry Detergent Necessary For Babies? May 7, 2014 | Posted by Lee C.
When you are welcoming a new baby to your family you want everything to be perfect. It makes sense that you may want a special laundry detergent to protect your new one’s sensitive skin. However, you may not need to pay the high price for specialized baby laundry detergents. Some babies are sensitive especially to fragrances and dyes. You do not have to use a special baby detergent to avoid these. Any brand that is free of fragrance and dyes will work. “Free and Clear” or “Natural” are often the labels used to describe this. There is also a good chance your child may not be sensitive to detergents at all. Baby Center suggests washing a few clothing items with your regular laundry. Check the baby for any reaction such as a rash or dry skin. If there is no evidence of a problem, you can wash all of your baby’s laundry with regular detergent. Using a liquid soap will also help, because all of the soap is rinsed more easily from the fabric. Powdered soap is more likely to leave residue behind that will irritate baby’s skin. If your baby does exhibit a sensitivity to laundry soap, remember to wash anything he or she may touch with free and clear detergent. This includes sheets, blankets, burp clothes and even your shirts and the shirts of anyone who may hold the baby regularly. If you are visiting a newborn, ask the parents for a blanket or burp cloth to put between you and the baby when you hold him or her. This will protect them from any scents or irritants you have on clothes. Keep in mind that a baby’s skin sensitivity could also be the result of soap or lotion. You may have to make sure all of your products are free of fragrances and dyes. Babies typically outgrow these sensitivities fairly quickly. By the time they are a year you may be doing the whole families laundry together! While no one wants their baby to experience discomfort, trial and error may be the only way to determine your baby’s sensitivities. You can save a bit of money by buying an all natural or free and clear detergent that is not marketed specifically for babies. How do you wash your baby’s clothes and sheets to make sure they are soft and comfortable? What Are Mothballs? And When Should I Use Them? 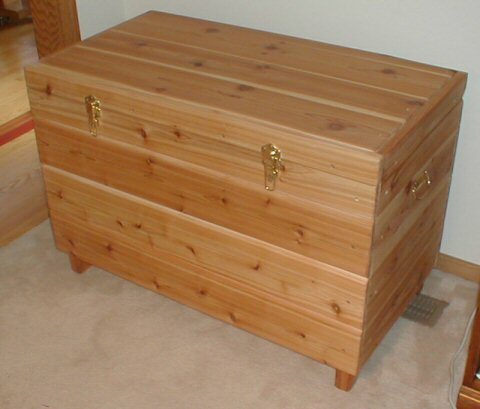 May 2, 2014 | Posted by Lee C.
Prevent an infestation by storing clothes and linens in a cedar chest. Everyone has experienced that unpleasant moth ball smell. It is often associated with older homes. But, what are mothballs and should you be using them? Mothballs are a chemical insecticide. There are several different kinds all made with chemicals, but they all work similarly. The chemicals change into gas and kill insects, larvae and eggs with the fumes. The best way to use moth balls is to seal them in a container with clothes that you are storing. It can work, but it is not as effective, to simply place mothballs in your closet. The build up of fumes is what causes damage to the insects. An entire closet is difficult to create enough exposure to the fumes to be effective. Mothballs are also dangerous for pets and children. Be careful not to leave them lying around within reach. Moths are particularly attracted to natural fibers, such as wool, but they will eat any fiber that may have a food or grease stain on them as well. It is best to use mothballs when you know you have a problem with bugs. According to How Stuff Works, the chemicals used in the balls should be inhaled as little as possible to avoid any harmful effects. 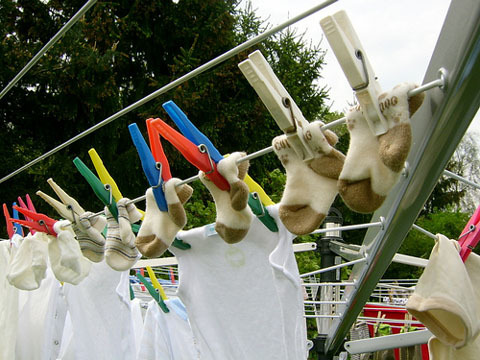 Hang any stored clothes outside to allow them to air out. You may even want to open the container they were stored in outdoors. You can avoid having to use mothballs by preventing an insect infestation before it starts. The scent of cedar repels bugs. You can keep cedar chips, sachets or blocks in your closet to repel bugs. Or, you can store clothes in cedar chests or closets. Cedar can be very expensive, but it is very good at keeping bugs out of your clothes. It also absorbs moisture preventing mildew and mold smells. According to Organize Your Life, cedar trunks should be sanded with a fine sandpaper every season to release the scent. Air tight containers can also help keep bugs out. Make sure the clothes are clean when placed in the containers so that you don’t introduce the pests into the space. In short use cedar to keep bugs from getting in your clothes and mothballs when there is already evidence of bugs in your clothes. Cedar repells and mothballs remove. Wash and dry clothes directly before storing them to remove any hidden eggs or larvae. Taking care of your clothes and linens can help them last longer and save you money in the long run. How do you store your seasonal items?